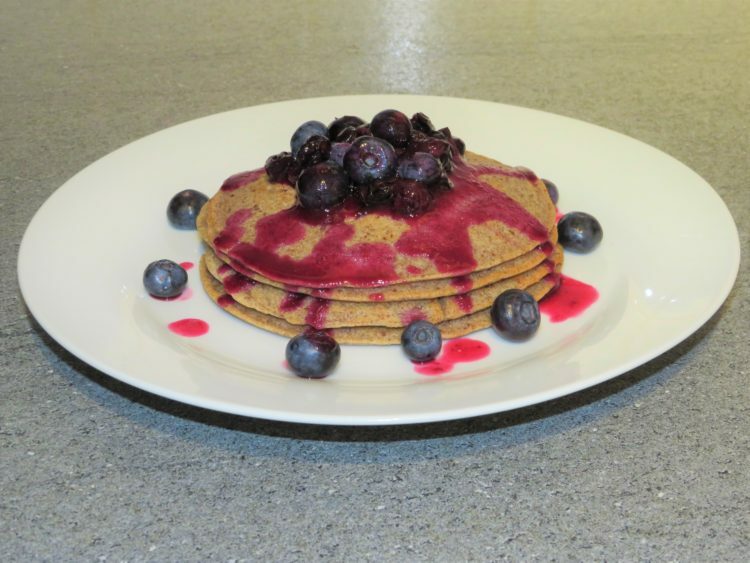 Buckwheat flour is a gluten free wholegrain flour with a nutty flavour and a good source of fibre. 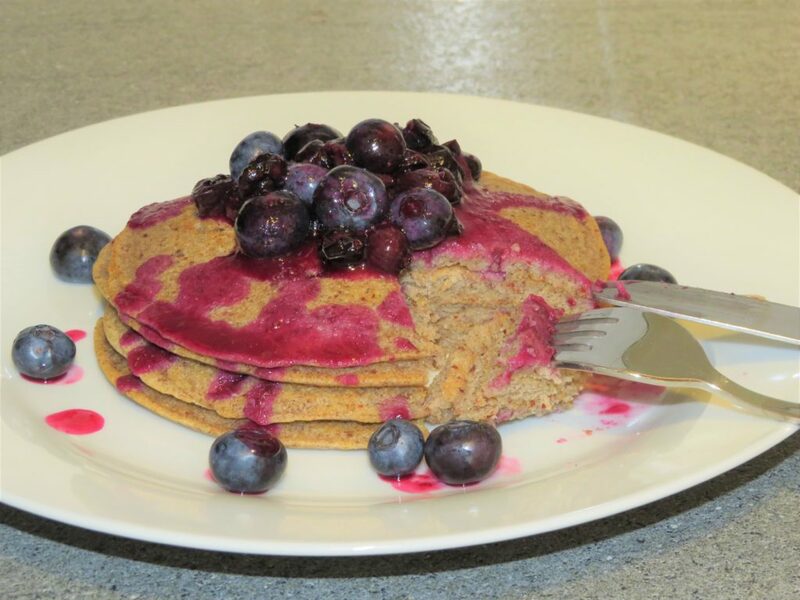 These pancakes are great for breakfast! 1 Mix the buckwheat flour and the baking powder together in a bowl, then make a well in the middle. 2 Pour in the flax egg, then the milk and whisk it all together. 3 Then add the agave syrup and vanilla. Whisk again and leave to stand for 5 minutes. 4 Heat a small frying pan on a low heat. When the pan is hot add ½-1 tsp of coconut oil, move the oil around the pan, then pour some of the mixture into the pan. Move the mixture around the pan it covers the pan to the desired size. 5 When little bubbles form, after about 1 minute, and it looks cooked enough, flip it over with a spatula. Let it cook on the other side for about a 1 minute. 6 Remove the pancake from the pan and repeat the process until you have used all the mixture. 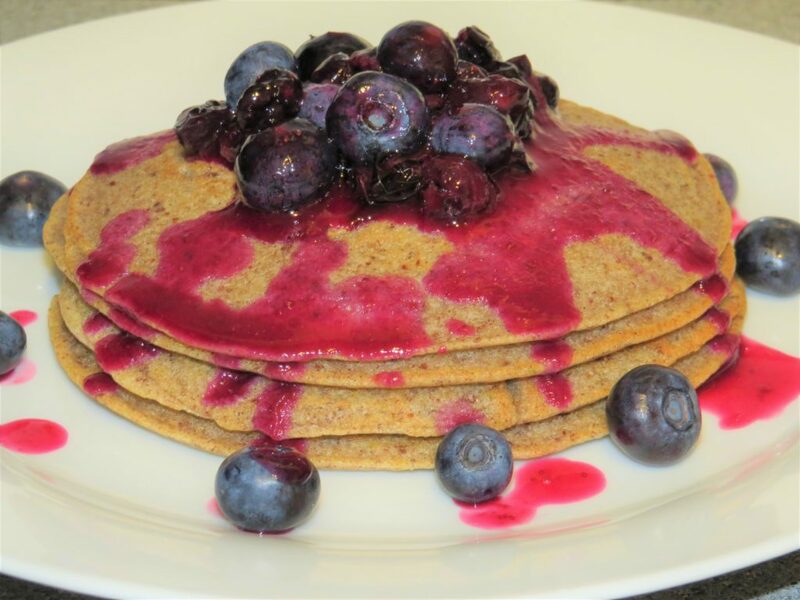 7 Then warm half of the blueberries for 10-15 seconds then top the pancakes with the warmed blueberries and the remaining blueberries and the juice from the blueberries drizzled all over or choice of topping and enjoy. Tip: Try adding sliced strawberries while cooking in the to the uncooked side before flipping it over. Buckwheat is a grain and no relation to wheat, it’s in fact a seed from a flower herb plant and is gluten free. The seeds are high in soluble and insoluble fibre, essential amino acid, protein and several different anti-oxidant properties. It also rich in B-complex vitamins, copper and magnesium. Milled Flax Seed is grounded golden and brown linseed also known as flaxseed are an excellent source of vitamin-E which is important for healthy skin. It also contains selenium, manganese, potassium, iron, calcium and magnesium.